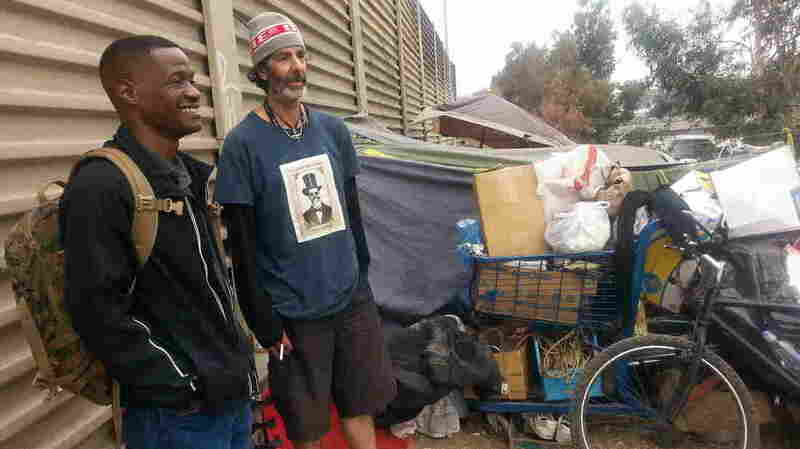 Fewer Homeless Veterans On LA's Streets The city's most recent homeless count showed that the veteran homeless population had declined 18 percent. But some advocates caution that veteran homelessness is an ever-changing dynamic. The lack of affordable housing is at the forefront of the homeless crisis in Los Angeles County. But the city's annual point-in-time homeless count, released on June 1, showed that the veteran homeless population had declined 18 percent. On this particular morning, Jesse Henderson is canvasing Hollywood Boulevard in Los Angeles. He's quick to point out this is not the stretch of the boulevard popular with tourists. Far from it. There's a certain vigilance and purpose in his stride. Understandable when you learn that the 39-year-old Army veteran did two tours in Iraq and one in Afghanistan. "Our basic job was to look for IEDs," he says and, when on patrol they had a saying, "Sometimes we'll find them, sometimes they'll find us." Today, Henderson has found a new mission: from searching out improvised explosive devices to searching for homeless veterans on the streets of Los Angeles. He looks for clues; a tent that's off by itself, a military blanket from the VA.
"Veterans usually have their stuff more in order," he says. Henderson approaches a row of low-slung tents. A homeless man tells him there's a veteran living in the brown tent at the end of the street. Henderson peeks through the mesh screen and introduces himself. The voice inside the tent is hardly audible, but politely answers, "No, I'm not a veteran." Henderson smiles and says, "OK, sorry to bother you brother." It's not an uncommon response, some veterans don't want to be found. Maybe they've had a bad experience with the military or just a hard re-entry into civilian life. It's all about gaining trust Henderson says. And he's been there. "There was a point where I didn't have anything and someone helped me with my needs," he says. Another homeless man leaning up against wall overhears the conversation and asks Henderson if he's a veteran. "Seven years Army," Henderson replies. The man smiles and nods his head. "They've been living there for four or five years," he says. "They get a new owner. The new owner comes in, everyone's gone and they turn it into an Airbnb. I call it the Airbnb effect." Still, this year's annual count of the homeless showed a significant decline in the numbers of veterans on the street. "This year's point in time count and the decrease really spoke to the hard work that was being done," said Heidi Marston, the director of Community Engagement and Reintegration at the West Los Angeles VA Medical Center. Although the previous year's veteran homeless count turned out to be not as high as initially reported, it did serve as a call to action for the VA.
"To kind of streamline our processes to get folks who are under the bridges and on the streets into housing," Marston explained. The VA also increased funding for a program that provides 90-day emergency housing for veterans like Air Force combat veteran Christopher Underwood. He suffers from PTSD and was facing imminent homelessness on the street. Underwood's now staying at a U.S.Vets facility in Inglewood. "And I'm thankful. Without this I'd probably be in a situation where you know... a little more desolate," Underwood said. Steve Peck, president of U.S.Vets says the VA's outreach and services accomplished a great deal, but he cautions that veteran homelessness is an ever-changing dynamic. "There were more first-time homeless than ever before," he says, adding that he's seeing an increasing number of post-Sept 11 veterans seeking help. "They're hopping from bed to bed, relative to relative, they're living in their cars," he says. "Some of them don't even consider themselves homeless because they're not sleeping literally on the sidewalk. But they are ...and they're suffering." Across town, on the sprawling campus of the West LA Veterans Affairs, it's early evening. Under flickering floodlights 63-year-old Marine veteran Robert Louis and his wife Gail are getting ready to bed down for the night in their car. "It's really rough as you can see it's not a big car," he said with a laugh. "There's not a lot of room to sleep in." The VA recently partnered with the nonprofit Safe Parking L.A. to provide 10 parking spaces for homeless veterans. There's a wash station and a portable bathroom. They have to leave in the morning. He turns and looks at his wife sitting next to him. "But we make the best of it," he said, as if reassuring her. The story of how they got here can be summed up to a few wrong decisions and Gail's diagnosis of cancer. Gail is wearing a blue sweatshirt and her hair in a loose upsweep. "It's been extremely depressing but I'm alive to experience it so I am forever grateful," she said. "They have tents or are just huddled up in doorways,"he said. "We're just thankful and we say a prayer for them, too."